Many salon owners believe they only need a cash register and excellent bookkeeping skills in order to run their store. However, a POS system can easily help you keep all of your money-related matters in line, without you wasting a moment of time. That being said, POS systems do much more than just provide support for your monetary needs. Instead, an excellent POS system also helps you identify who your customers really are. It does this by helping you keep notes on their needs, appointments, and even their preferred employee. Additionally, you can use a hair salon POS system to increase customer loyalty rewards, thus maintaining your client base. Ultimately, your POS system does not define your business. However, you certainly want to choose the best POS system which meets your business’s definition. Below, we have reviewed the top 3 POS systems for hair salons. Square is a POS system known for its clean lines and availability for retail, restaurant, and appointment-based businesses. While Square began with a simple card scanning tool which attaches to most iPads, it has now evolved into a full-blown POS system. 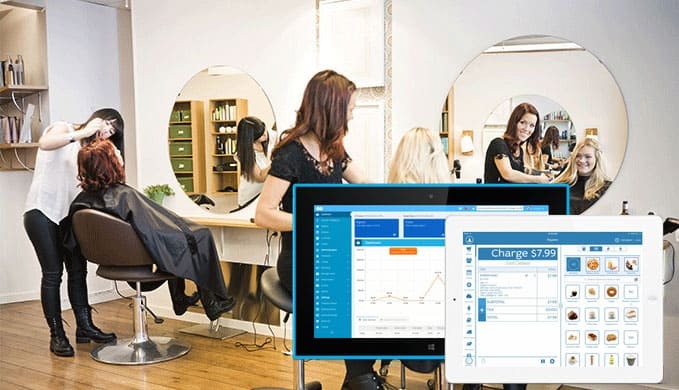 Read on to learn how Square POS could help your hair salon be the best possible. There are several key features with this POS which make it unique for a hair salon. To begin with, most of the features are available online, making it easily accessed. To being with, customers can use Square to book all of their appointments online. This is aided by intelligent scheduling, which automates who serves your customers. The intelligent scheduling also takes into account the individual customer’s preferences. After your customers are finished at your salon, you have options for where you check them out. You can do so at your individual station, allowing for quick and easy access and very little waiting. However, you can also use a stationary desk, just keep in mind this may mean that customers have to wait for others to check out first. At checkout, your customers have many ways to pay. They can use credit, debit, check or cash. If the customer chooses, your system can even remember their card, allowing for quick and easy checkout. If you are an individual who owns and runs their own hair salon, you can use Square for free. All you will pay is a 2.75% charge per card which is used. However, if you have 2-5 employees, you will have to pay $50 per month and 2.5% and 10 cents per swipe. Finally, for a hair salon of more than 5 employees, the cost rises to $90/month. Additionally, there is still 2.5% and 10 cents for any used cards. These costs are certainly not extravagant, and they allow you to slowly grow your business. All of this can be done without losing any sort of significant income. You can maintain your inventory from the POS. A great number of reports can be run through Square. There are many ways which customers can pay. The POS can sync the calendars of all employees. 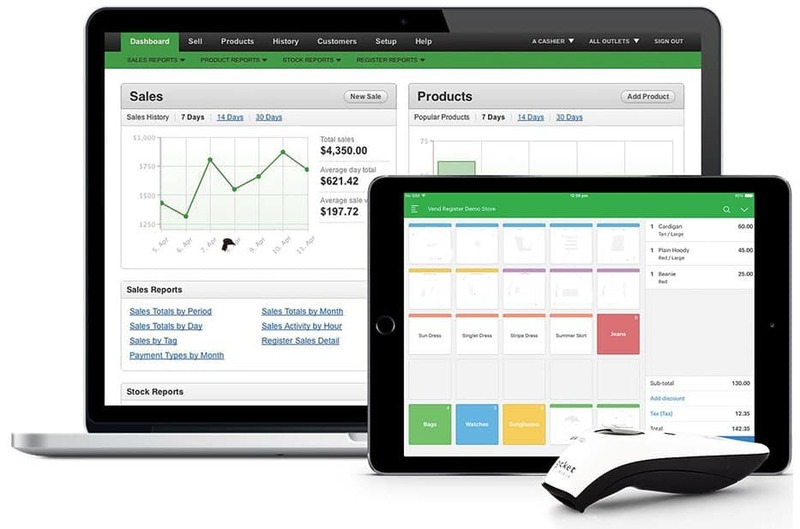 The main complaint of Square is that there are not a great number of features available. However, due to the low cost, Square certainly rises above and beyond. Ultimately, this POS system is made to support hair salons with one worker the best. 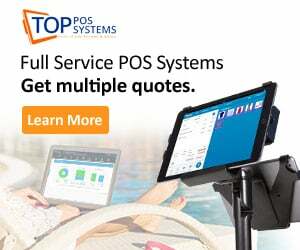 With very low costs and standard features to make your work easier, you simply cannot turn this hair salon POS system down. Keep in mind the excellent checkout features and the ability to keep notes on each customer. These features ease your efforts and give your customers the best service. Versum is a POS system which is known for classic clean lines. However, their main goal as a POS company is to streamline everything you do on a day to day business. This means that it should be much easier for you to gain and keep customers. 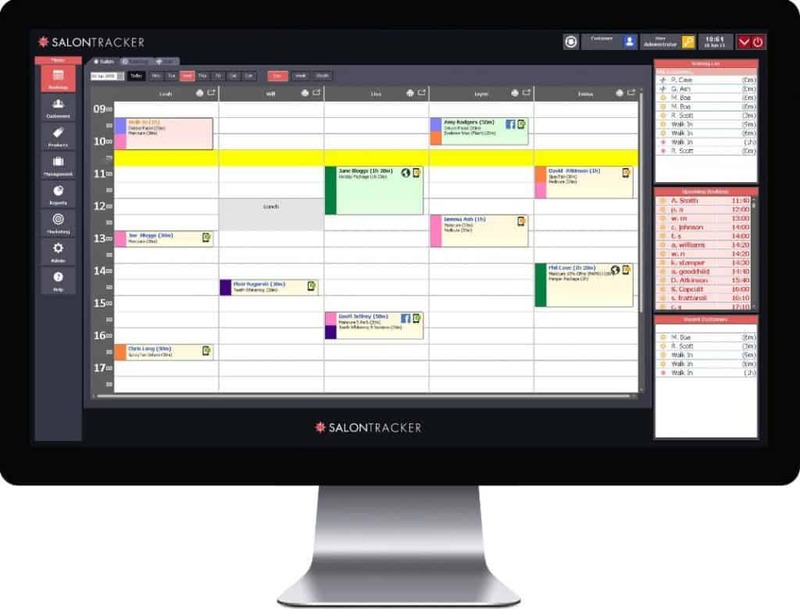 First, the POS system allows you to create a calendar incredibly easily. This calendar not only lets you see who is coming in, but it lets you view each customer’s appointment history. Additionally, the calendar automatically sends out appointment reminders to your customers. This ensures they don’t miss appointments and it helps you keep customers coming back. An extra feature is the online scheduling. If your customers don’t have their calendar with them, they can easily schedule their desired appointment online, at any time! In addition, the POS can create a loyalty system for your customers. This can be accentuated by automatic emails which can be sent detailing sales, etc. Another feature which is incredibly important is the ability to run various reports. Most business owners don’t know how to effectively run reports of their spending and income, and they also can’t do so in real-time. 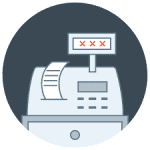 Versum POS allows you to run reports specifically to analyze how much cash should be in your register. This is a huge feature, as this report can be run instantly at any time. Other reports are standard financial statistics and sales. These reports basically allow you to analyze how your store is doing in terms of sales and how you compare to previous months or years. A final report is a report which analyzes how your employees are performing. This report helps you see which employees are making the most money through commission and tips. The benefits of a report like this ultimately allow you to help train employees who are not doing as well. One common concern is that the appointment reminders can cost customers additional fees. This can be frustrating for customers and can cause them to refuse the reminders. The pricing for Versum is a larger range. You can pay as little as $25/month if you are a single stylist working in your salon. Ultimately this hair salon POS system is incredibly efficient and remarkably versatile. It allows you to use it on computers and smart devices and meets the needs of the customers first and foremost. To begin with, vend can be web-based on software based. In other words, you can use it through any internet browser or you can use is specifically on an Apple product. However, you do not have to choose any one of these options, you can use all three of them at the same time. Afraid of the internet crashing and being unable to use the website or app? Never fear, Vend is an offline system as well. This means that as soon as the internet is back up, Vend will automatically sync all sales that were made while offline. Aside from just aiding your customer, Vend is all about the employee as well. To be specific, Vend streamlines traditional staff tasks, trains your staff, and analyzes their performance. One of the keys to Vend is that it is incredibly easy to use. That being said, the training feature on Vend takes very little time and allows you to make sure all employees know precisely what they are doing. Additionally, you can run reports to analyze your staff’s performance. If you pay based on commission, your employees may want you to set individual goals for each of them. In order to do this effectively, you can set daily, weekly, and monthly targets for each employee. You can then analyze which employees are hitting the mark and which are not. This may help you train employees who are underperforming by allowing them to partner with your overperforming employees. 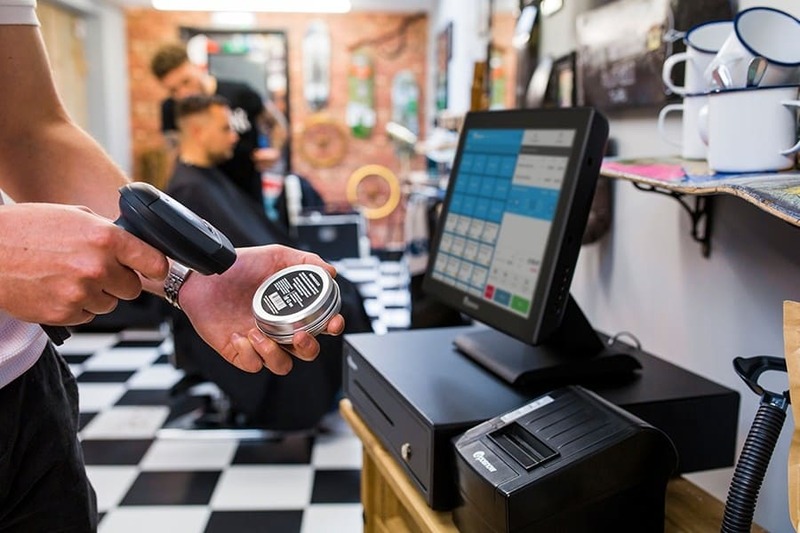 As a hair salon POS system, Vend offers many additional features which are too many to list here. An E-commerce program which allows you to sell products digitally. 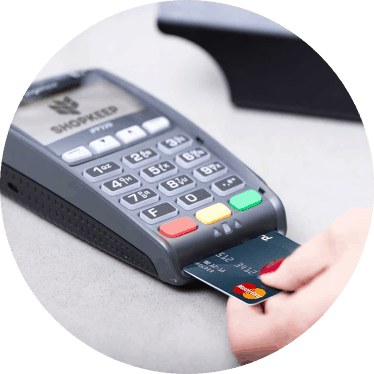 Hardware which can be purchased or integrated in order to use the POS system. A variety of ways for customers to make payments in and out of store. Comprehensive inventory tracking, which allows you to make sure your customers can always get the items they want. This also helps you know what to order. Many features to enhance the experience of your customers. Vend reporting has an incredible number of pre-made reports for you to access. This POS system allows for growth by allowing you to have multiple stores on your system. Fantastic 24/7 customer support, both electronic and over the phone. The range of pricing for Vend is fairly simple. You will pay between $99 and $159 each month. Your cost can be lowered simply by paying annually instead of monthly. 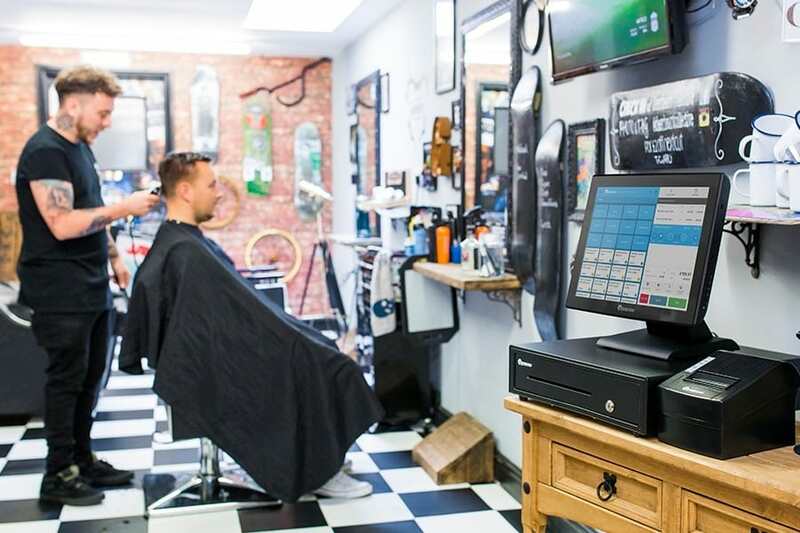 Now that you’ve read our reviews of the top hair salon POS systems, you need to consider which features are the best in any hair salon system. This will help you understand the needs of your store specifically. Remember, just because a POS system is reputable, does not mean it is for every single business on the market. We encourage you to really assess which POS systems allow you the best overall performance. Below, we detail the features that any hair salon POS should be able to provide you in order for your store to stay effective and efficient. Many options for payment, including credit, debit, cash, and check. Customer history and preferences automatically added details to their appointment. The ability for customers to pay for services ahead of time. A report which can instantly audit your cash register. 24/7 customer service and training for employees. This is sometimes called onboarding. While many of these features are majorly advantageous, especially to your customer, not all are necessary or even needed. For instance, if you allow your customers to sign up for their own appointments, can they see the availability of each individual employee? That being said, many of these features allow you to streamline your work and make your employees more efficient. Take special notice of important features and assess which ones your store must have. For any POS system to be effective, you must be sure all of your employees can use the program. Most POS systems offer full-time customer service, but you may want to ensure that the POS system provides you with employee training or onboarding. If your POS system does not provide this, it may be in your best interest to have one or two employees who know the system inside and out and can be scheduled to work until all employees feel comfortable. A way to truly cut down on your employee’s time not working is to ensure that your customers can sign up for their appointments online. Before purchasing any POS system, make sure that your POS system has the appropriate online scheduling set up. Some owners prefer for the set up to simply allow the customer to input a time and be either confirmed or denied for that time. Others prefer their customers to see the entire schedule, but not which employees are busy at various times. A final option is to have the full schedule and each employee’s schedule available online. Remember, this is probably the most consuming part of setting up any POS system, so take your time ensuring your POS system has the correct schedule options first. Then check multiple times to ensure your digital calendar is working properly. The best hair salon POS system on the market is easily Square. This system is efficient and low-cost, making it easy for your employees and customers to feel supported and safe. 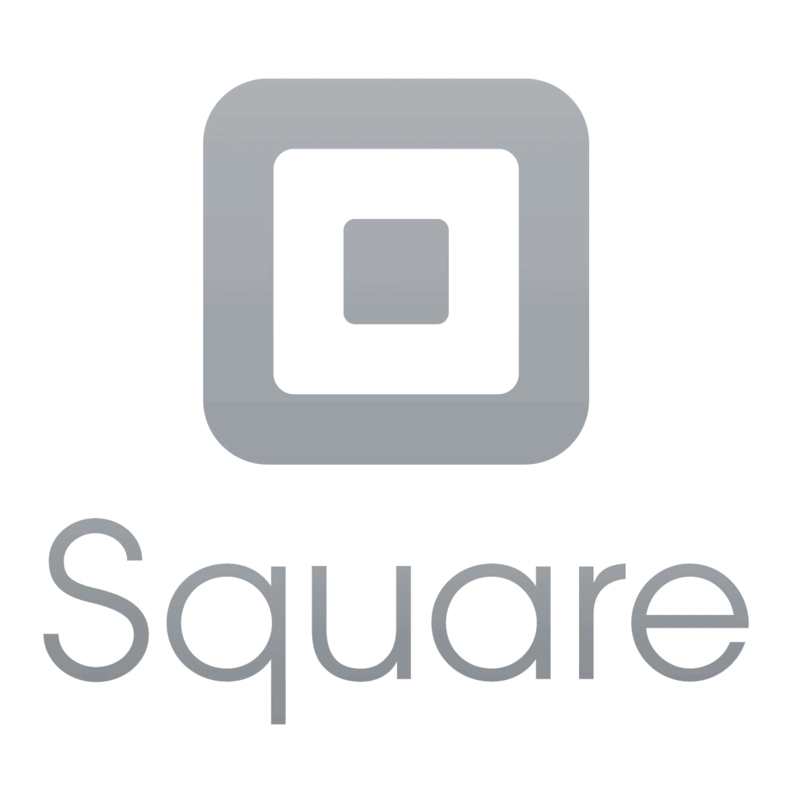 We encourage you to at least try Square for a time period. 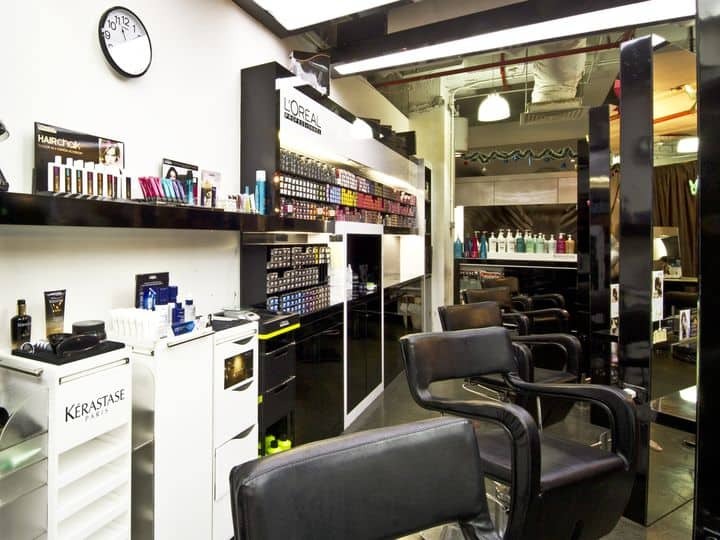 If it is not a long-term solution for your hair salon, there is no real loss to your store.